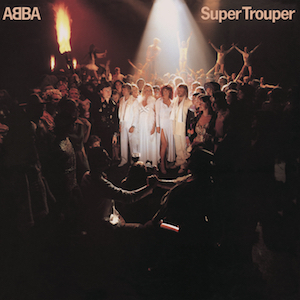 This is the front cover for the album Super Trouper by the artist ABBA. The cover art copyright is believed to belong to Polar Music. Main infobox. The image is used for identification in the context of critical commentary of the work for which it serves as cover art. It makes a significant contribution to the user's understanding of the article, which could not practically be conveyed by words alone. The image is placed in the infobox at the top of the article discussing the work, to show the primary visual image associated with the work, and to help the user quickly identify the work and know they have found what they are looking for. Use for this purpose does not compete with the purposes of the original artwork, namely the artist's providing graphic design services to music concerns and in turn marketing music to the public. As musical cover art, the image is not replaceable by free content; any other image that shows the packaging of the music would also be copyrighted, and any version that is not true to the original would be inadequate for identification or commentary. Use of the cover art in the article complies with Wikipedia non-free content policy and fair use under United States copyright law as described above. Section. The image is used for identification in the context of critical commentary of the work for which it serves as cover art. It makes a significant contribution to the user's understanding of the article, which could not practically be conveyed by words alone. This image will be used to illustrate which record has the most pre-orders ever (over one million) received for a United Kingdom album. Use for this purpose does not compete with the purposes of the original artwork, namely the artist's providing graphic design services to music concerns and in turn marketing music to the public. As musical cover art, the image is not replaceable by free content; any other image that shows the packaging of the music would also be copyrighted, and any version that is not true to the original would be inadequate for identification or commentary. Using a different image would be misleading as to the identity of the work. This page was last edited on 23 September 2017, at 00:52 (UTC).